Art-C: ANDREA Air Filter ..........an eco-friendly & cost-effective design concept!!!! ANDREA Air Filter ..........an eco-friendly & cost-effective design concept!!!! 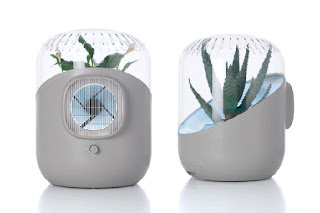 The ANDREA Air Filter which is currently sold in the US, uses household plants as natural indoor air cleaners thus ridding air of toxins & pollutants. It was invented by the French designer, Mathieu Lehanneur in collaboration with Harvard professor David Edward. The Air filter is 40 times more effecient than activated carbon filters & requires no filter changes. 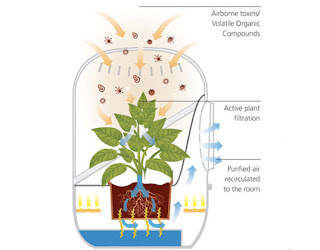 It works on a very simple procedure, purifying air by forcefully drawing it into a noiseless fan to propel it through the roots & leaves of plants, then out through water & once it is soil filtered, the air is sent back to the atmosphere. The process uses the plant's natural metabolic activity to transform the waste biochemically, thus eliminating pollution. Also any household plants like Alo Vera, spider plant etc can be used for their ability to absorb & metabolise toxins. 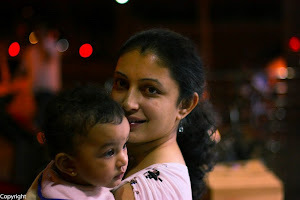 In our quest for growth, we seem to have ignored the side & after-effects of human intervention & have to contend with various accompanying hazards. Lets hope, products like the above help reduce our carbon footprint to some extent atleast!!! !